Pembroke Pines has two seasons- warm and hot. While the winters are dry, the summers receive significant rainfall, with June and September being the wettest months. 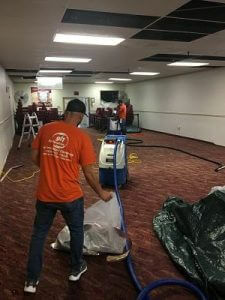 The hot, muggy summers put homes and businesses at risk of being impacted by water damage and mold infestations, issues that the technicians at 911 Restoration of Miami are experts at remediating. If the frequent showers expose cracks in your roof, rain can leak into your home or business, requiring professional water damage restoration services to restore the property entirely. When you need emergency leak detection and water extraction services, the repair techs guarantee to arrive at your residential or commercial property within 45 minutes of receiving your call. The Miami office is open 24/7/365 to assist you. So, call 911 Restoration if your home or business needs flood cleanup service and we will start the process by giving the property owner a free visual inspection. Receiving leak detection and repair services as soon as you notice any signs of water damage, such as stains on your ceiling and walls and musty odors. By reaching out for water damage restoration services at these early stages, you may be able to prevent rotting drywall, pipe mold, and structural damages. We want you to feel comfortable turning to us when you need to know what to do when your house gets flooded or springs a leak. Staff members will immediately answer all your questions and send out a water cleanup team to begin water extraction services. Along with controlling all flood and leak issues, technicians will also provide a mold inspection. 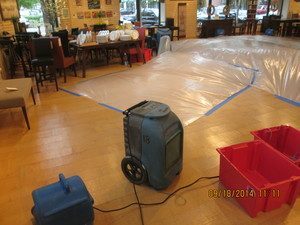 We know from experience that water damage and mold go hand-in-hand and the mold experts want to control the situation as soon as possible. You can depend on 911 Restoration of Miami to provide all types of water and mold cleanup services to residents of Pembroke Pines. So, whether you need us to quickly fix a water leak in the ceiling or clean up after a toilet flood, give us a call right away. Property owners in Pembroke Pines continuously need to be on the lookout for signs of mold growth in their homes and businesses. The summer climate is especially favorable to mold. The high humidity and warm temperatures create the perfect environment for mold spores to flourish into an infestation. Mold on walls and ceilings are the most visible types of infestations, but fungi are often found in dark, hidden places, such as under sinks, behind wallpaper, inside of drywall, up in the attic, and in air ducts. 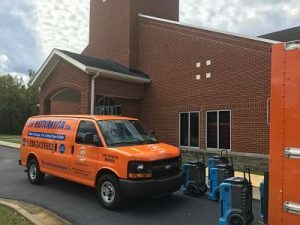 The mold experts know exactly where to look for mold infestations, and they understand that mold can move behind the walls and spread throughout the property relatively quickly. It only takes 24 hours for mold to begin to grow after it has been exposed to moisture, making it crucial to reach out to the Miami mold specialists as soon you notice signs of an infestation. If you notice a musty smell in a particular room, discover water damage, or find that your pipes are leaking, call 911 Restoration of Miami today, and we will get to work cleaning mold out of your property right away.